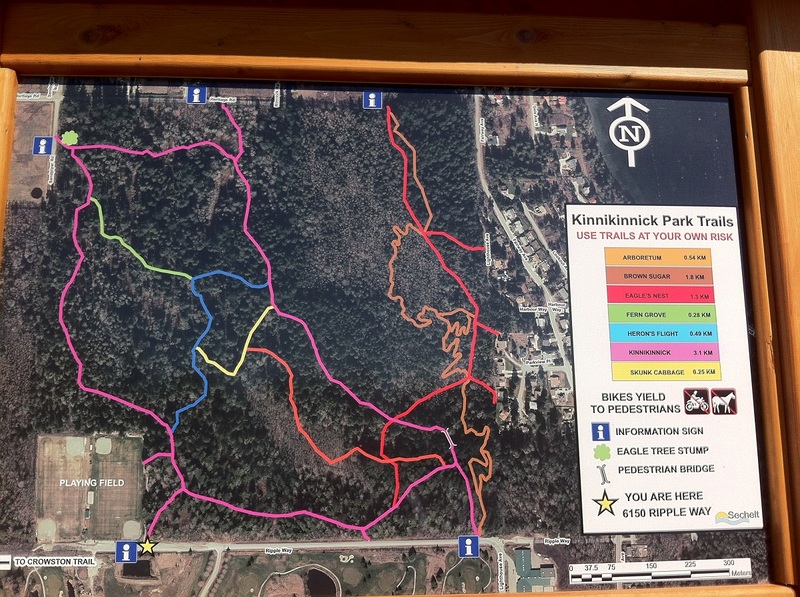 Kinnikinnick Park is the largest park within the town of Sechelt and boasts not only sports fields and a playground, but also several kilometres of excellent hiking and biking trails. The trails are colour coded with easy to follow trails markers, and you can do as much or as little hiking as you would like. Trails vary in length from the longest pink loop at 3.1 km to the short yellow trail at just .25 km. Feel free to bring your dog too; Kinnikinnick allows well behaved pets to be off-leash. Tree lovers will surely find this park to be one of their favourites, as every trail winds through enormous towering trees, and even some old growth stumps left behind that are easily over 5 feet in diameter. The wide dirt paths are soft underfoot which makes for superb trail running as well as biking. In fact, the newest trail, Brown Sugar, was created over several years by students in the Capilano University Mountain Bike Operations program. They incorporated a number of bridges and banks to create more technical elements, but these are easily bypassed by hikers and newer bikers. Hiking on this beautiful day in fall also gives the chance to pick blackberries as you go– a juicy treat along your way. Please be aware as the wonderful bounty of berries also can attract bears, so you’ll certainly want to be prepared in case of an encounter. There are multiple access points to the trail system, off Ripple Way, Heritage Road, and Lighthouse Avenue. The main parking area is located at the sports fields at the end of Ripple Way, but there are decent pullouts for parking at any of the access points. To get to the end of Ripple Way, follow Highway 101 into the community of Sechelt. Turn right on Trail Avenue which will turn into Reef Road. At Shoal Way take a left and then a right on Lookout Avenue. On Ripple Way take a left and continue past the Sechelt Golf Club and onto Kinnikinnick Park.